FLOUR + BUTTER: Job or Hobby? If you ask my neighbors about the best part of living near me, you’ll get the same response - the volume of baked goods that comes from my place. The most recent birthday cake I made for my husband. I love baking. A lot. I love making birthday cakes, desserts when we have people over for dinner, sourdough bread, fiddly pastries, and everything in between. To me, baking = engineering. It’s precise and hands on and requires immense attention to detail. I want to get a list of very specific steps and execute the heck out of it. It is so immensely satisfying. 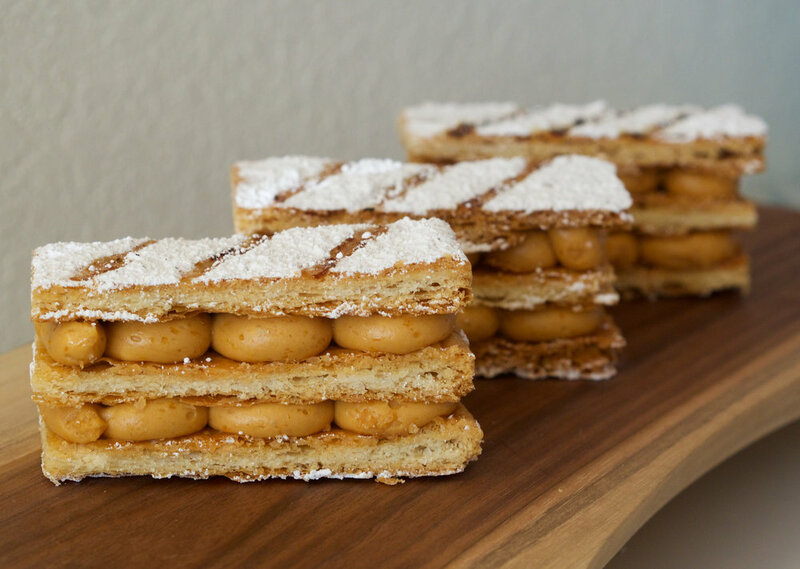 Napoleon with caramel mousseline (homemade puff pastry). 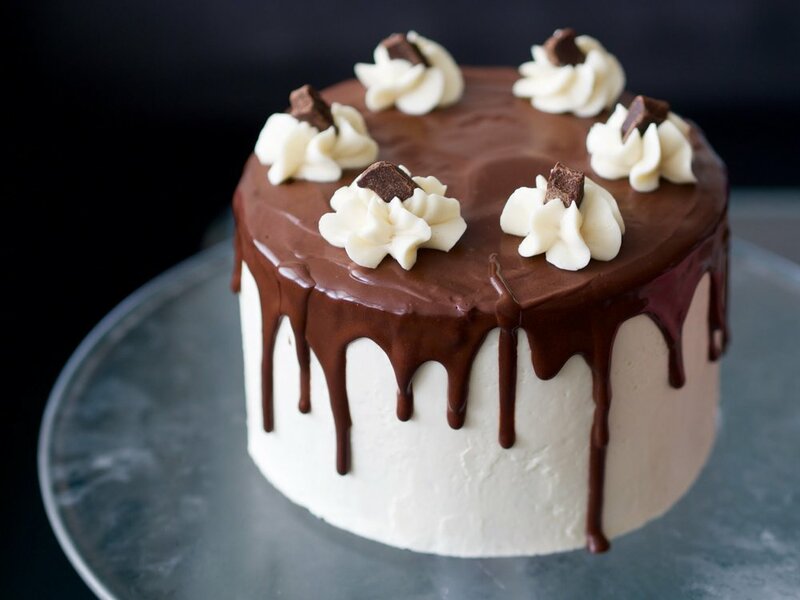 Beautiful to look at, messy to eat. So naturally, when you have an interest and something that you’re good at, people tell you to do it as a job! And this story, is exactly why (at least for now) I know that keeping baking as a hobby is the right choice for me. In 2016, after baking for fun for many years (and hearing “you should be a baker!” for many years), I decided that to treat myself to a 5 day class at the San Francisco Baking Institute. It’s something I had always wanted to do and after I left Google, I finally had time to do it. So so so so so happy. Also the lemon meringue tart was delicious. I got my baking jacket as instructed (talk about feeling like an imposter!) and jumped into the 5 day course. I was one of the only enthusiast bakers (most class participants are professional bakers and a lot of them fly in from countries all over the world) and my benchmate was a baker who runs several French bakeries in Canada. I’ve never had more fun in my life. I baked for 8 hours a day for 5 days straight, my feet have never been so tired in my life, I baked more than I have in the previous 3 years and if I had the chance, I would do it all again the following week. I loved it? It was the best? I wanted to do it all again? Then why don’t I want to do it as a career? An example of what one day’s agenda looks like and the amount of things we make… and bring home. Learning: I got to learn an unbelievable amount in those 5 days. We had lecture every day to learn about the properties of butter, the differences between active-dry and instant yeast, why you need to boil pastry cream (it’s because of the cornstarch), why you need two different kinds of crusts for the bottom and top layer of an apple pie, etc. As the most curious human being there is, I was FASCINATED. Variety: We got to make an incredible variety of things, every single day was different. One day we’d make 7 things. The next day we’d make 5 new things. Challenge/Novelty: I had made almost none of the things we baked across the 5 days. It was all new to me and challenged my brain every single day. What this class helped me realize is that the things I loved about the 5 day class aren't necessarily the things I would encounter if I did it for a job. The challenge of newness would be gone pretty quickly. A strawberry and pistachio Breton tart. Bakers work unbelievably hard. Some bakers start work at 3am or earlier. My 5:45am wake-up was rough enough for 5 days, I can’t imagine 3am. Or doing it every week of my life. I know that I enjoy taking my time while baking and I’m not a particularly fast baker. Watching some of the other professional bakers, I saw that volume and output were baked into their actions (pun definitely intended). They were focused on doing things quickly and creating as many of a thing as possible because that’s how they operate in their own bakeries. To me that might take some of the joy out of it. Knowing that working in a bakery wouldn’t prioritize my biggest values or the working environment I need in order to thrive, gives me the confidence to say that working in a bakery is not a good fit for me. So I’m baker for a week, once a year, and absolutely love that experience. Now. I’m not saying that I won’t ever do baking as a job. My priorities could change, I could start to find joy in getting really good at a small number of pastries, I could do it for a summer to test it out again in the future, etc. Or, I could design it based on what I know about myself. Knowing that I would never survive a 3am wake-up, what if I opened a bakery that was open just for dessert? Pastries available 8-11pm? Given that I loved the challenge/learning/novelty aspect of the class, what if I had a pop-up bakery that only made one thing every day and sold out when the pastries were gone? I’d get to choose what I want to make every day and it could be different every day. I could try new things as often as I’d like. 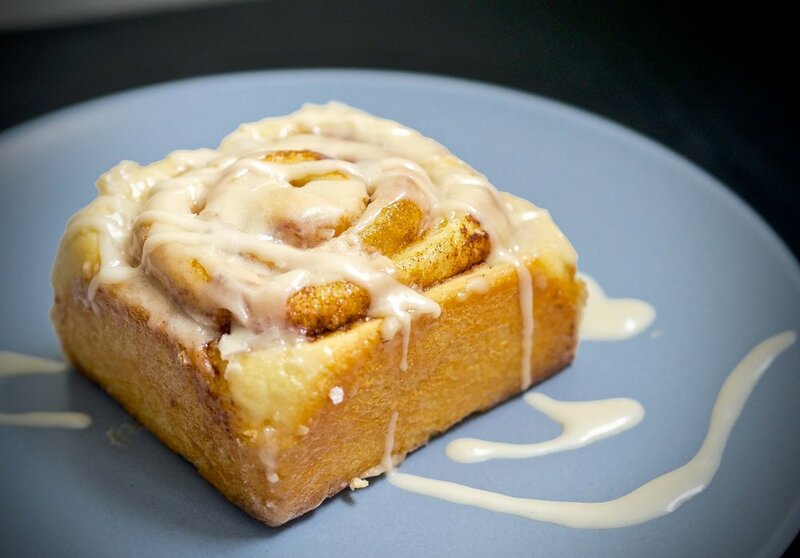 These cinnamon rolls are unbelievable. I wish this could be scratch-n-sniff. Test it out in the smallest way possible! Do a one day class, shadow someone who does the job, sign up for a short course. Don’t quit your job and spend all your money on more training before testing it out. Articulate what you loved about it. What was great, which of your values did it prioritize. Compare that to what it would actually be like if you did it as a job. Talk to someone who does it as a profession and check any assumptions you have. See if you can creatively design a way to do it as a job that would be a good fit what you know about yourself. Knowing what you do and don’t like can be very useful as design inputs for how to make the job a good fit for you. And so I love my hobby. I’ll continue taking classes at the SFBI as long as I can. And when people suggest it as a job, I’ll thank them and not feel any pressure to become a baker, because I know that it’s not the right fit for me. Strawberry cupcakes with strawberry buttercream. Homemade croissants I brought to a workshop. If you're analytically minded and feeling uninspired or crushed by an ill-fitting job, check out my group program - Crushed to Confident. Get un-crushed, rigorously evaluate and understand your current role and confidently make career decisions that feel good to you. Join the list here to get first access to the 12 spots.